Look carefully! 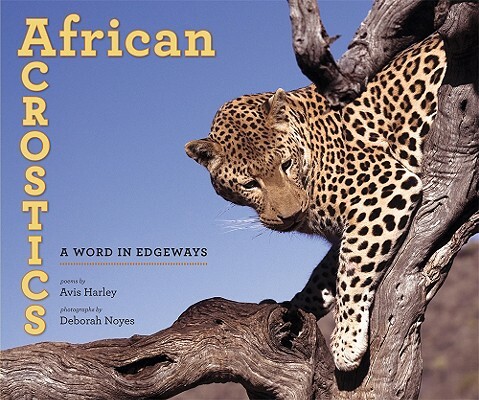 The wild animals of Africa spring to life in clever, lighthearted poems and compelling, evocative photographs. Inside every acrostic is a secret message, often lurking in the first letter of each line (read top to bottom). But look out! These acrostics not only follow their subjects to Africa, but they also take the form to a whole new level. Here you’ll find the elusive double acrostic (in which the first and last letters of each line spell a message), the cross acrostic (in which the message is read diagonally), and the multiple acrostic (see it to believe it) — not to mention lions, zebras, crocodiles, hippos, leopards, and elephants. Oh, my! Illustrated with gorgeous full-color photographs, this collection is sure to send poetry buffs and animal lovers on an armchair safari they’ll never forget. Avis Harley has written several books of poetry for children, including THE MONARCH'S PROGRESS: POEMS WITH WINGS. She lives in Vancouver. Deborah Noyes the editor of GOTHIC!, THE RESTLESS DEAD, and SIDESHOW. A former zookeeper, she also wrote and illustrated ONE KINGDOM: OUR LIVES WITH ANIMALS. She lives in Somerville, Massachusetts.